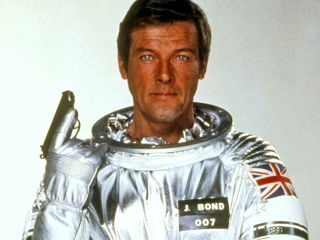 Roger Moore dons a spacesuit for James Bond's space mission in 1979's "Moonraker." Roger Moore, the British actor who launched James Bond into space in "Moonraker," died Tuesday (May 23) in Switzerland, according to press reports. He was 89. In "Moonraker," Moore's Bond teams up with NASA scientist Holly Goodhead to track down a space shuttle hijacked by villain Hugo Drax, leading to a climactic battle on a space station, complete with lasers. So as a memoriam for Moore, here's a look back at some great space scenes from "Moonraker."